In my previous post I talked about where we got the yardage and meter averages featured in StashBot. They are based on actual body measurements - in the case of sweaters we've added + 2" / 5cm of ease +10%, and for all other project types we've added a 10% pad. In all cases we are talking about basic Stockinette Stitch pieces. Do you typically like more ease, cables, more length or a hood? You'll need more yarn! Future versions of the app may allow you to do things like add a hood or different length sleeves, etc. But hopefully this tool, as it is now, gives you a starting place when you have no pattern to reference. You'll be able to knit SOMETHING with the estimated yardage. Also, in most cases the estimated yardage will not be exactly divisible by the yardage of the skein you're considering. That's okay! In these cases round up, not down. More yarn will increase your pattern choices in the future. On that note, let's take the app for a test spin and see some real world examples. StashBot suggests for a size 40" / 102cm chest and a gauge of 13 sts per 4 inches / 10cm an estimated 720 yds / 660m will be needed. Kate's pattern suggests 700 yds for this size. We have a match! Let's say you were originally shopping for Rowan British Sheep Breeds Chunky, which this pattern calls for. The 120 yards skeins would evenly divide into the 720 estimated yards 6 times. 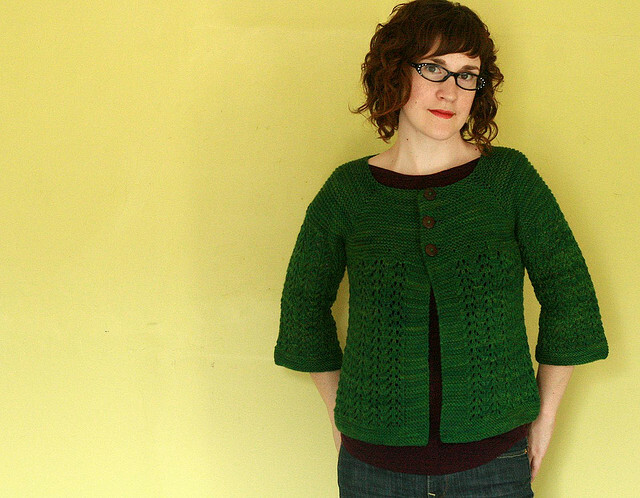 If you were on a budget, that's great, you know with those 6 skeins you'll have some sweater patterns to choose from. As we can see from our example above, it's true, you do! If you were in a position to grab one more skein you'd increase your options for the future. This pattern is 12 sts per 4" / 10cm, your stashed yarn from the first example will still be a good fit. Size 38.5" requires 735 yards. So if you'd grabbed that extra skein that might be good, although you may be able to squeeze this sweater out of the 720 yds since it's knitted from the top down, you could always shorten the torso and sleeves a tad if necessary. Keep in mind most listed yardage requirements in patterns also include some percentage of a pad! Let's say we were shopping and discovered Sundara Worsted Merino. 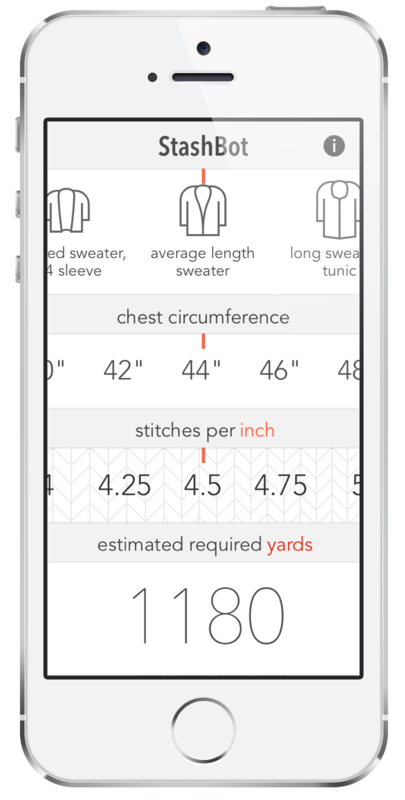 Using StashBot we learn we'd need an estimated 1180 yds / 1080m to knit ourselves a 44" / 112cm average length sweater. Since the skeins come with 175 yds and we can't purchase 6.75 skeins, we would have purchased 7 skeins for a total of 1225 yards. Later, when we're looking for a pattern, we discover that this popular sweater requires 1150 yards. We have a match! This sweater has 3/4 length sleeves, we may have enough yarn left over to lengthen them a bit. Average length sweater is pretty easy to categorize. StashBot also includes cropped and long sweater categories. In the future we'd like to expand on the long sweater category. For instance, there are elongated, swingy cardigans which is what I had in mind when I established the long sweater category...and there there are LONG sweaters that are more like jackets with hoods. We hope to add a category to encompass these types of sweaters in the future! 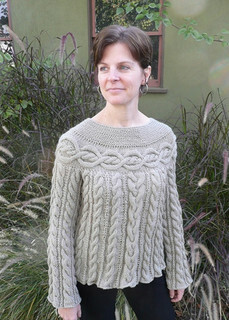 In the meantime, here's an example of a long cardigan that fits with StashBot's data. Shopping for Rowan Felted Tweed, you would have found at 22 sts per inch / 10cm you'd need 1600 yds / 1460m for a 44" / 112cm, long sweater. You would have purchased 9 skeins for a total of 1719 yards. When pattern surfing you might come across this sweater and discover you have enough yarn to knit your size, as it calls for 1650 yards. A match! Both of these beautiful sweaters feature a lot of cables, and the jacket to the left is really the most sweater you could every knit! If our estimate included this sweater, StashBot would have you overbuying for the majority of patterns. There is no substitute for having a pattern in hand that tells you exactly how much yarn you need for that project. But for those instances where you don't have a pattern in hand, we hope that StashBot can be the friend that helps you purchase enough yarn to knit something from your stash in the future! Many have been writing in an letting us know their wish list for future updates to StashBot. We love that, it's very helpful! For example, in the near future we are going to increase the gauge range from 3 - 8 sts / inch to 2 - 10 sts per inch. Have more ideas or wishes? Send us a note!